On our second day in Yosemite, we got going at a reasonable time. It was still pretty cold in the morning until the sun had a chance to warm the place up a bit. Bridal Veil Creek Campground is at an elevation of 7000 feet so expect it to be a little colder than some of the campgrounds at lower elevation. We had coffee and a warm breakfast to help us warm up though. The plan for day two was to head down into the valley to explore and to do the short hike up to the bridge below Vernal Falls. This would be our only full day in Yosemite for this quick car camping trip so we wanted to make the best of it. Our first stop on the way down to the valley was at the iconic Tunnel View stop. 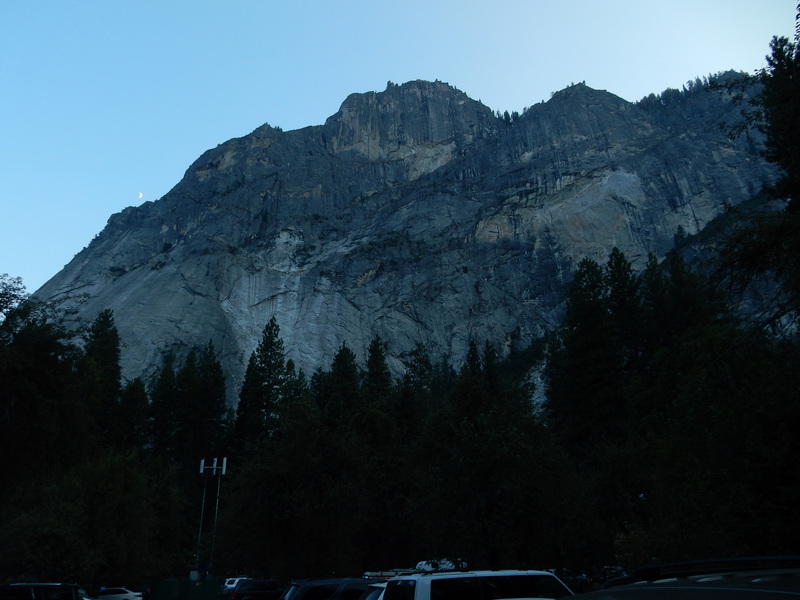 Don’t pass this parking lot up if you are coming in to Yosemite from the south. If you are not drive up here anyway. 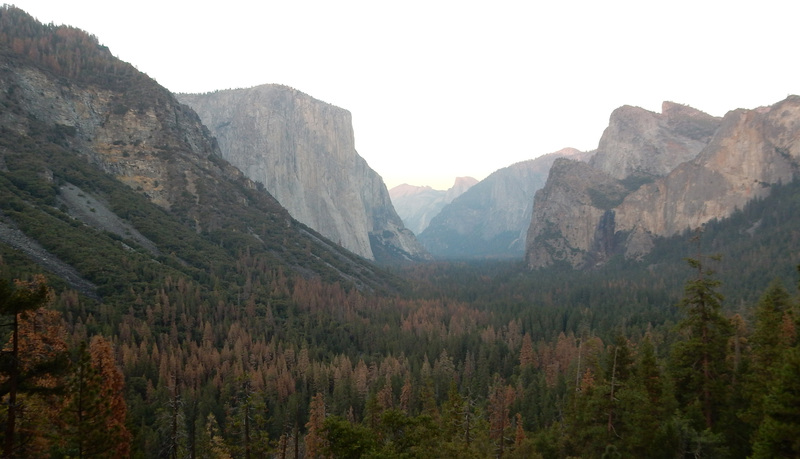 No visit to Yosemite is complete without seeing the valley from this angle! It was a hazy fall day, so the valley features are blurred, but if every picture I took from this place was under the same conditions it would be a bit boring. So I love this picture as much as any I have taken from Tunnel View. Also take note of the yellow/dead trees in the foreground. 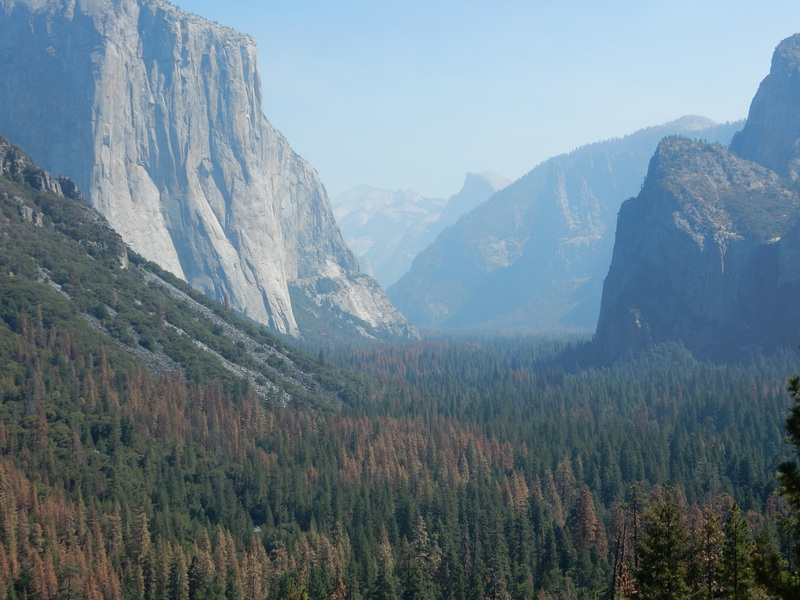 Although the main Yosemite Valley area was mostly unaffected by the bark beetle when we visited in September 2016, the surrounding areas were affected and some areas you could see from the high roads leading into the park from the south were absolutely devastated. As I write this there is a huge fire, the 2017 Detwiler fire is raging west of Yosemite. Although I fear this fire could easily rage through these areas damaged by the bark beetle I have mixed feelings about it. Some area have 50% or more dead trees and so I don’t know what else could clear this many dead trees. I feel for the residents in this area who may lose their homes and I hope everyone involved stays safe, but unfortunately large fires in California are inevitable over the next several years until these large swaths of dead trees are cleared. Our plan for our only full day in Yosemite was to hike up the John Muir/Mist Trail to at least the bridge below Vernal Falls. This part of the trail is fairly easy and paved to the bridge. 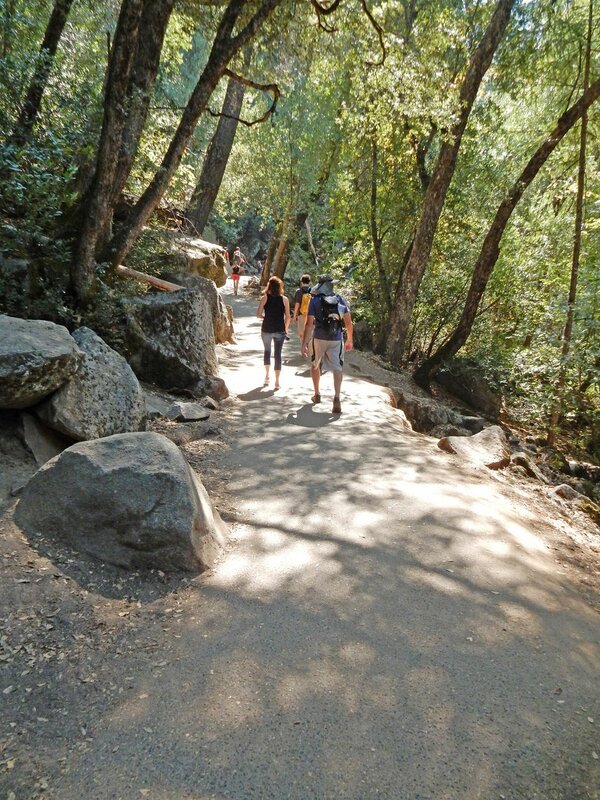 It does have some steep parts, but walking up through the rocks and trees is worth it. We came down at the end of our 2010 Panorama Trail hike in 2010. 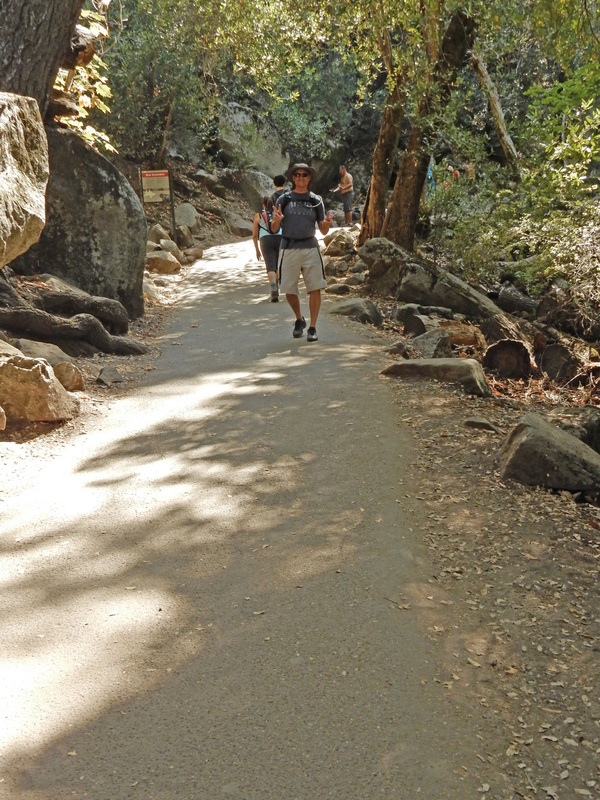 I thought back to that hike when I saw Dave walking backward up the trail. In 2010 we had not done much training to prepare for the Panorama Trail hike, and we were really feeling it in our calves by this part of the trail. The youngsters (Sean and Matthew) were doing fine, but Dave, Richard, and I were feeling it. 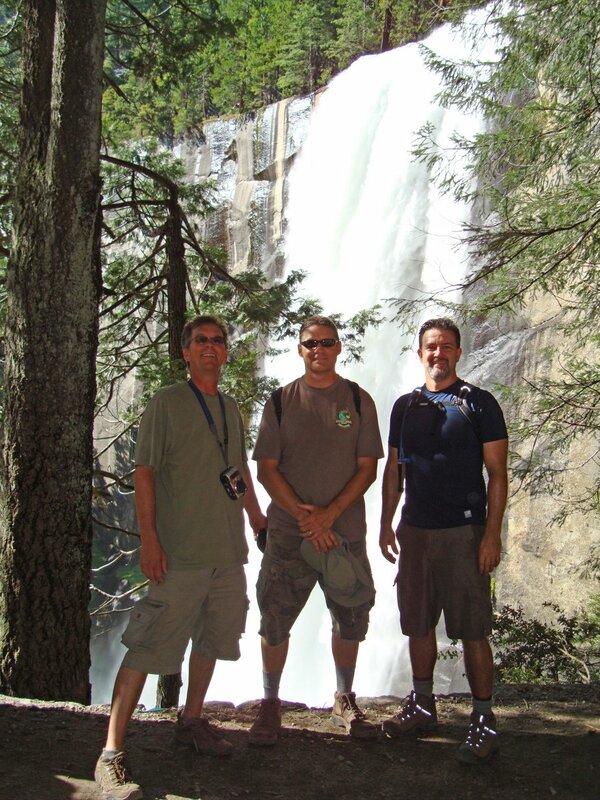 I don’t have pictures of us lower on the trail to Vernal, but I do have a picture of the 3 old guys on the Mist Trail just below Vernal Falls. We would not go that high on the trail on this trip, and there would be much less water on Vernal, but this is a beautiful trail no matter what the conditions are. This time there would only be a trickle of water coming over Vernal Falls and even that was barely visible from the bridge. We had our lunch on the rocks just past the bridge. As usual the squirrels, and birds were very interested in our food. We headed back down from this point and back to where we parked at Curry Village. Yeah I know they renamed it to Half Dome Village, but I’m not interested in what it says on the signs! It will always be Curry Village to me. We did some souvenir shopping at Curry Village and the Main Yosemite Village stores, and then decided to get Pizza. It was fortune for us that the Pizza Parlor at the Yosemite Village was closed, because that lead us back to Curry Village to the Pizza place there. The pizza was good, but the real win was the lighting on the canyon walls when we got ready to leave. We stopped on the side of the road just outside Curry Village. From there we saw quite a show. 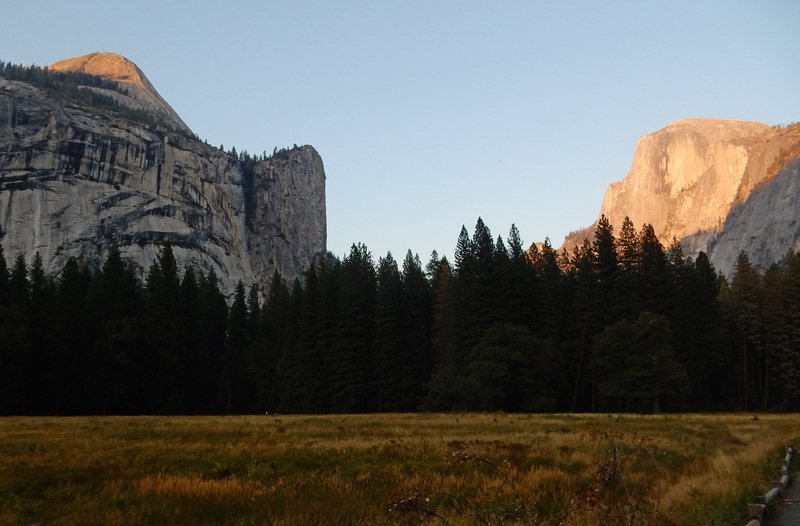 Half Dome and North Dome were lit to a Golden Glow. 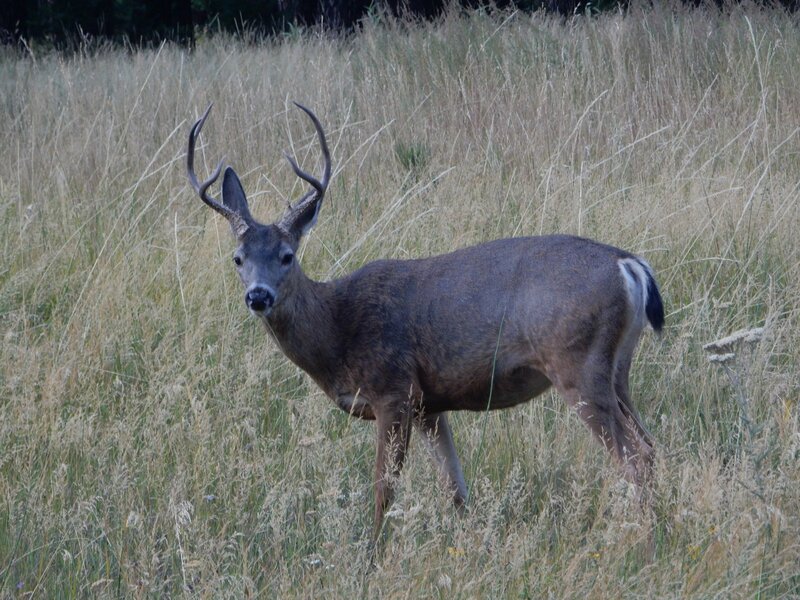 A deer was grazing on grass just a little ways off the road. 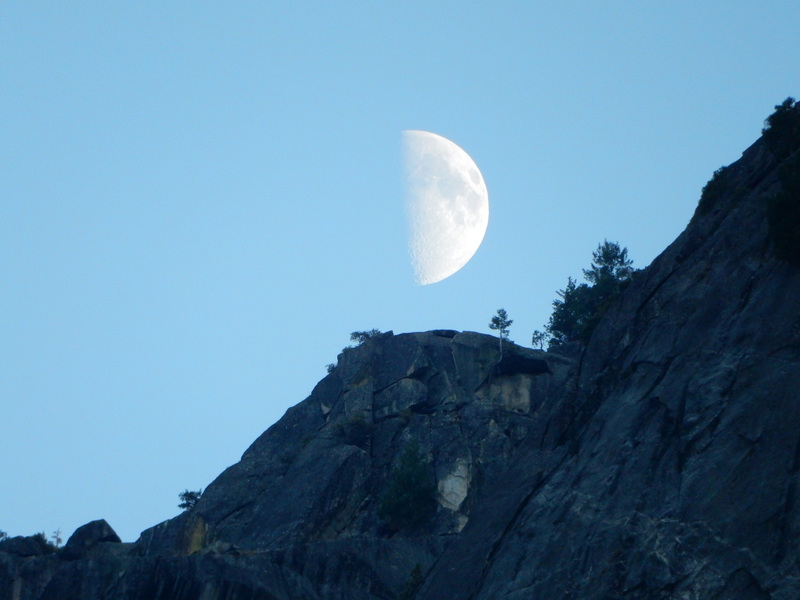 And the moon was just about to set behind Glacier Point. As much as I love those pictures, my favorite picture of the trip would be a drive by picture at Tunnel View on our way back to Bridal Veil campgrounds. It was getting late and we still had a ways to go to get back to our campsite, so no one really wanted to get out to look take a second look. I snapped this picture from the car. Normally I try to get up to the wall and leave everyone out of this picture. What I like so much about this picture is the people. 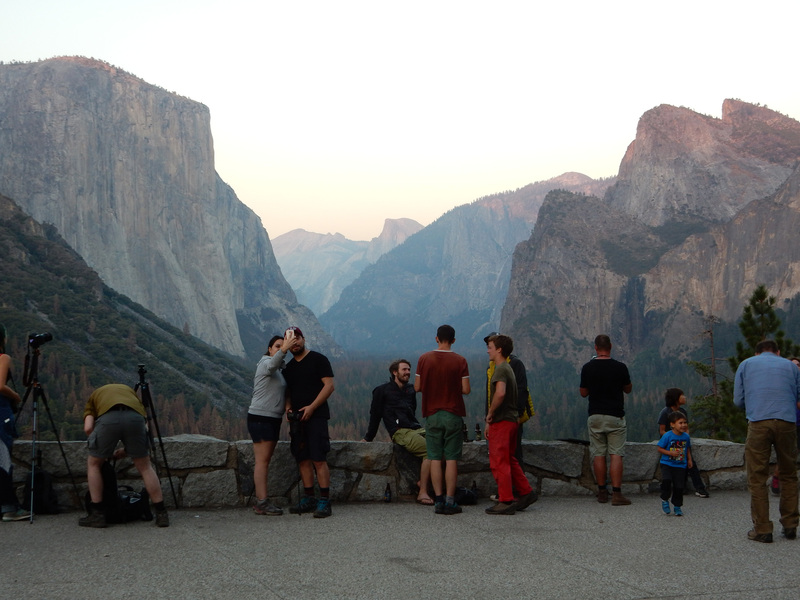 The smiles, the families… this is really what I love most about Yosemite, sharing it with family and friends. The lighting was great though, so I parked and ran up for one more picture, without the people. Beautiful, but I like the first one better. We got back to camp, started a campfire and braved the cold for a few hours of visiting. Unfortunately we would be breaking down camp in the morning and heading home. It was a short, but fun trip, and we are always glad to hang with Dave and Wendy! 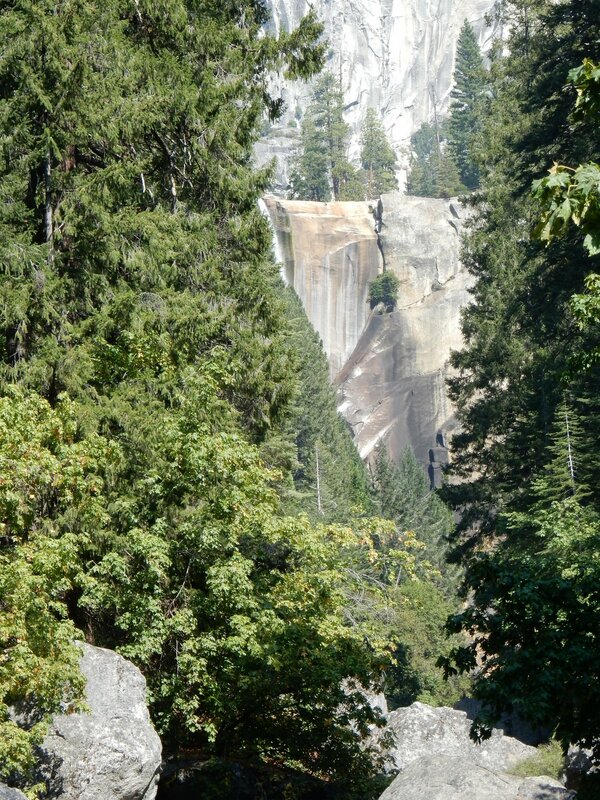 We will definitely be back to Yosemite and I would love to stay at Bridal Veil Campgrounds again. I think our next visit is likely to be a back-country trip though. The High Sierra Camps most likely (just added that to the Bucket List not long ago). All the joys of a backpack trip without the backpack! Great post and gorgeous photos. We have been there twice.